Yesterday I finished Matthew Paul Turner’s new book, Our Great Big American God. 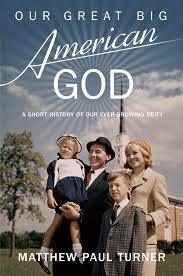 It purports to be a biography of God in America. Through most of the book, one gets the idea that God is a taken-for-granted character supporting those around whom the story revolves. The character that seems to be behind everything but always interpreted by others, like Nick Fury to the Avengers. So in reality, God is only visible in the book through the explanations of the main characters, who themselves only got a quick glimpse of God that fit their understanding of their world at the time. It’s like looking though the kaleidoscope I had as a child. You look through the tube and see an interesting design. A simple turn of the little lens at the end shifted the image and gave rise to an entirely different design. There is little coherence between one and another. So it appears to be with America’s understanding of God. Turner picks up astutely on the ways in which Americans from William Bradford to Walter Rauschenbusch to Jerry Falwell read God into their work. It’s not that they were using God, exactly. They just only saw one pattern. And that pattern seemed to remarkably fit where their own interests lie. Abraham Lincoln’s caution that we should try to find ourselves on God’s side rather than wanting God on our side was lost on many American religious leaders throughout history. The Puritans had a harsh God that was impossible to please, which was okay as long as you were one of the elect in spite of your depravity. The kaleidoscope shifts and we begin to focus on a God that speaks directly to people (even women!). Then a great awakening comes to America and Jesus moves to the forefront. 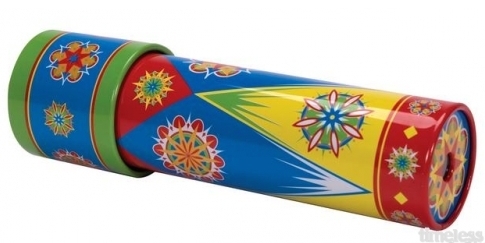 Methodism likes the kaleidoscope pattern that best relates to westward expansion and circuit riding preachers. There are different patterns in North and South during the civil war (and for decades afterward). The Fundamentalists tried to hold their pattern in place against a shifting civil society. The Pentecostals brought a new patterns, introducing spectacle and celebrity. The political evangelicalism of the of the 1980s through recent years read a pattern that called for them to act because God needed their help. There is great history in the book. If you read the endnotes, you’ll find citations from some of the best religious historians around: George Marsden, Thomas Kidd, Mark Noll, Stephen Prothero. In the last year I’ve read Robert McKenzie’s The First Thanksgiving, Molly Worthen’s Apostles of Reason (on the rise of evangelicalism), and Randall Balmer’s biography of Jimmy Carter, Redeemer. All of these books, plus others I’ve read tell similar stories to what Turner shares in this little book. In other words, his history is solid even if understandably abbreviated. The writing style is a combination of Sarah Vowell and Kurt Vonnegut; wry, slightly irreverent, managing social commentary while quietly admiring the intent of the actors in the story (for the most part). It made me miss the days when I faithfully read The Wittenberg Door. What’s surprising about the book is that it’s more than a funny read of issues in American religion. Pay attention and you find a deep analysis of the dangers of syncretism and civil religion. It’s what happens when we pay more attention to ourselves and our own religious systems that we do to the God who is acting in our midst. The book also provides something of an atlas to the contemporary issues in American Evangelicalism. The kaleidoscope patterns that defined early groups can still be found in today’s expression. While Turner helps connect those dots along the way, it’s pretty easy to see how the varied strands of religious expression continue to take shape. Yes, the book is a light-hearted look at the way we think about God in America. But more than that, it’s about how people wrestle to make sense of the incomprehensibility of the Creator and Sustainer of the Universe. It calls out those who would reduce that God to a product to be managed (which he characterizes as GOD®) and requires us to maintain an appropriate intellectual humility. Maybe then we can understand the story that God is actually writing rather than the patterns we think we see.